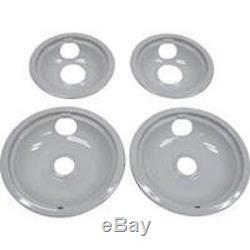 Range Oven Drip Pan Set W10291024 for Jenn-Air. Replacement drip pan set, gray in color. Includes 2 large 8" drip bowls and 2 small 6" drip bowls. Please not, that if your originals were two-piece ring and pan, you will no longer need the ring replacement with this set. Manufactured by Whirlpool to fit many models including Jenn-Air stoves listed below. Replaces part numbers: W10291024, 814116, 4396091, 4396090, 4396091RW, 4396090RW, 74003440, 74003441, Y04100195, Y04100196, 4396073, 04100195, 74003439, 308649T, 308648T, 308648T, 308649T, 74003439, 74001520, 74001520, 814114, Y04100195, 306789, 305840T, 305839T, 305838T, 305837T, 305389T, 305380T, 305379T, 301168T, 301167T, 242956, 242955, 74001519, 74001518, 309427T, 309426T, 309113T, 309112T, 308938T, 308937T, 305840T, 305839T, 305838T, 305837T, 305389T, 305380T, AP4510066. For Jenn-Air Models: CCE1400W, CCE1400W, CCE1400W-C, CCE407W, CCE407W-C, CVE1400W, CVE1400W-C, CVE407W, CVE407W-C, FCE10500W, FCE10500WC, FCE10501WC, FCE10510W, FCE10610W, FCE10610WC, FCE2012W, JE3842VRV, JER8500AAW, JER8530AAW, JER8550AAW, JER8550ACW, JER8650AAW. Thank you for shopping with. We are happy to help in any way we can to provide a positive shopping experience! The item "Range Oven Drip Pan Set W10291024 for Jenn-Air" is in sale since Monday, November 24, 2014. This item is in the category "Home & Garden\Major Appliances\Ranges & Cooking Appliances\Parts & Accessories".